Hello again! 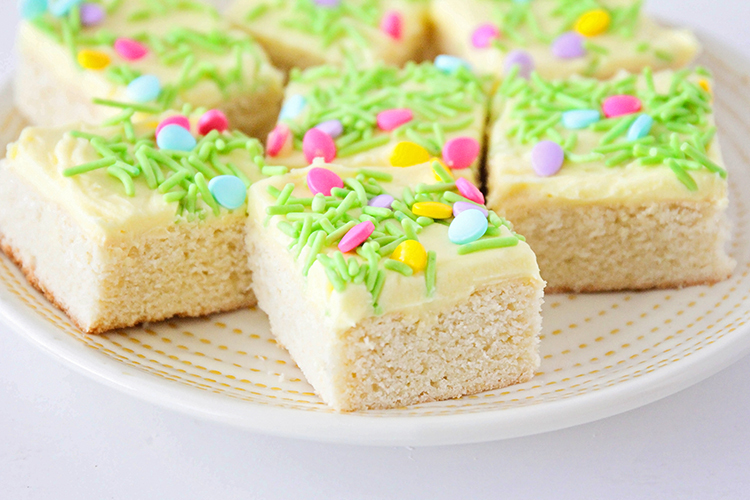 It’s Alicia from The Baker Upstairs, and I’m so excited to share these spring sugar cookie bars with you today. 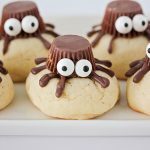 Not only are they adorable, delicious, and fun to make, they’re also super easy and way quicker than roll-out sugar cookies! After a long series of rainy and snowy days in the past few weeks, we’ve finally had several days in a row of sunny weather, and it is making me all kinds of excited for spring! It’s almost like a switch has flipped in my brain, and now all I can think about are sunny walks at the park, short sleeves, and spring flowers. I had definitely fallen into a bit of a winter slump, and now I’m looking forward to all of our fun spring traditions. I feel like I can finally see the light at the end of the tunnel! Since my default response to any situation is to get busy baking, I decided that a delicious spring dessert was the perfect way to celebrate. I have an undying love for sugar cookies, and as much as I enjoy roll-out sugar cookies, sometimes I just don’t want to put in all of the time and effort. These cookie bars have all the sugar cookie taste I love, but without the rolling, cutting, re-rolling, and busy work of roll-out cookies. 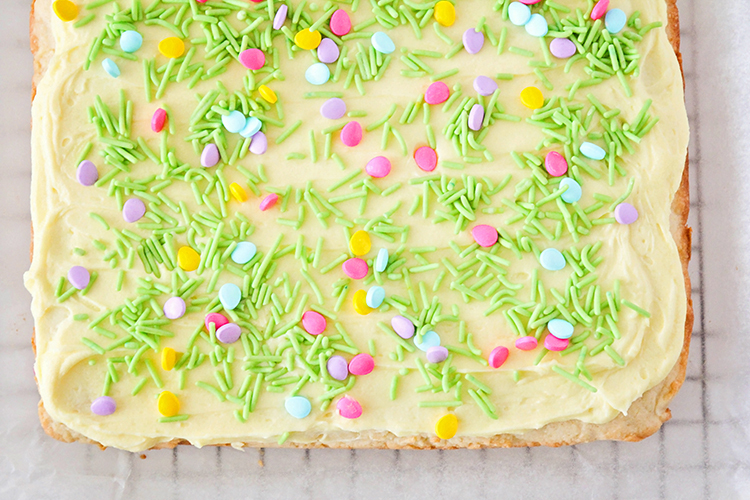 I topped them with some bright springy frosting, added some adorable sprinkles, and had a delicious spring dessert with very little effort on my part. That’s always a win! 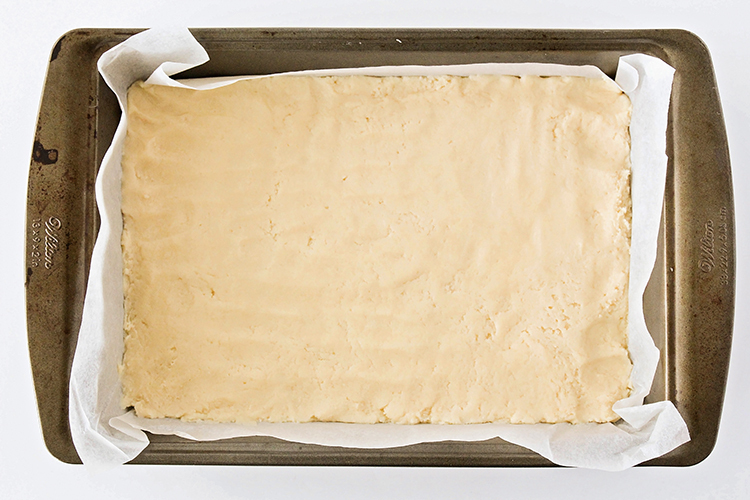 The dough mixes up quickly with a stand mixer or hand mixer, and then it’s time to press it into a 9 x 13 baking dish. It’s a little sticky and thick, so I’ve found it easiest to roll it out between two sheets of parchment or plastic wrap to the right size, then press it into the baking dish. 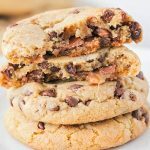 Be sure to poke holes throughout the dough to allow steam to escape, so you won’t have big air bubbles in the finished cookies. Bake the cookies until they’re just lightly golden on top, and the top feels firm. Once the cookies have cooled completely, it’s time to add your frosting and sprinkles! I chose a bright sunny yellow that reminded me of warm spring days, but you could choose any color you like. I found these adorable spring sprinkles at Target in the seasonal section, and they are so cute! The cookie bars themselves are soft and thick, and not overly sweet. When you combine them with the fluffy sweet frosting, they are perfect together! The sprinkles on top make them fun and festive. 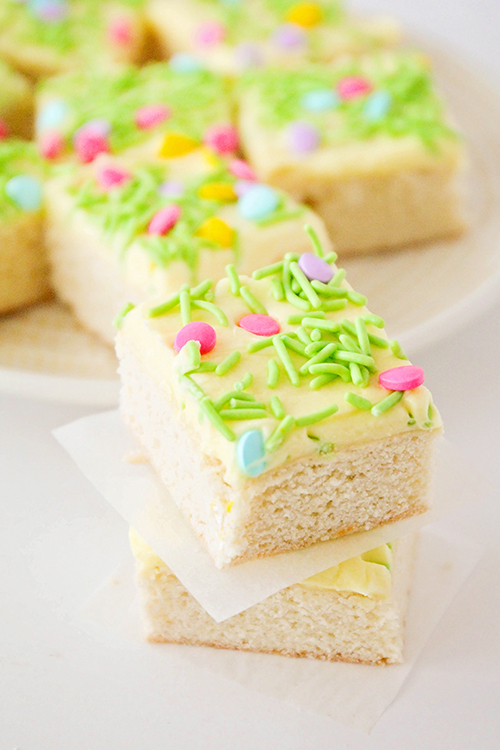 I think they would be perfect for an Easter dessert, or for a spring party treat! I usually cut my cookie bars into 24 pieces, but you can make the pieces larger or smaller according to your preference. They are fairly rich, so one piece is usually enough for me. 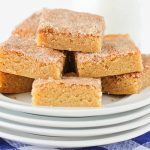 These cookie bars will keep well in an airtight container, so they are be a great dessert to make the night before a party or event and relieve some stress on the day of the event. Preheat oven to 375. 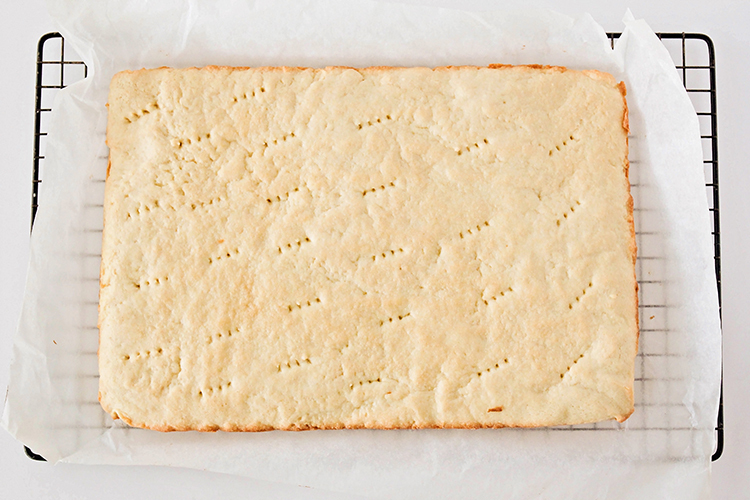 Line a 9 x 13 pan with foil or parchment, and set aside. In a large bowl or the bowl of a stand mixer, cream together the butter and sugar until light and fluffy. Add the eggs, sour cream, and vanilla, and mix until well combined. Stir in the flour, baking powder, and salt to form a crumbly dough. Press the dough into the prepared pan to form an even layer, and poke the dough every few inches with a fork so it will bake evenly. Bake17-20 minutes or until lightly browned around the edges. Cool completely. 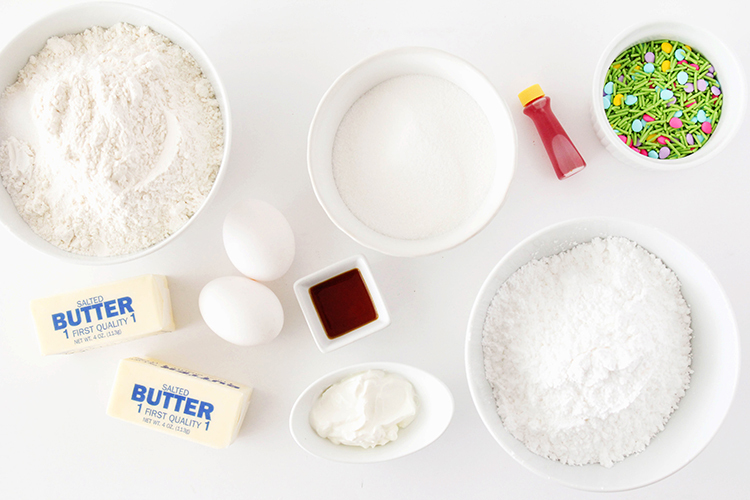 To make the frosting, beat together the butter, powdered sugar, and 1 tablespoon half and half. Add additional half and half as needed to make a smooth frosting. Add the vanilla, salt, and food coloring, and beat on high speed until light and fluffy. Spread over the cooled cookies and add sprinkles. Cut into squares and enjoy! 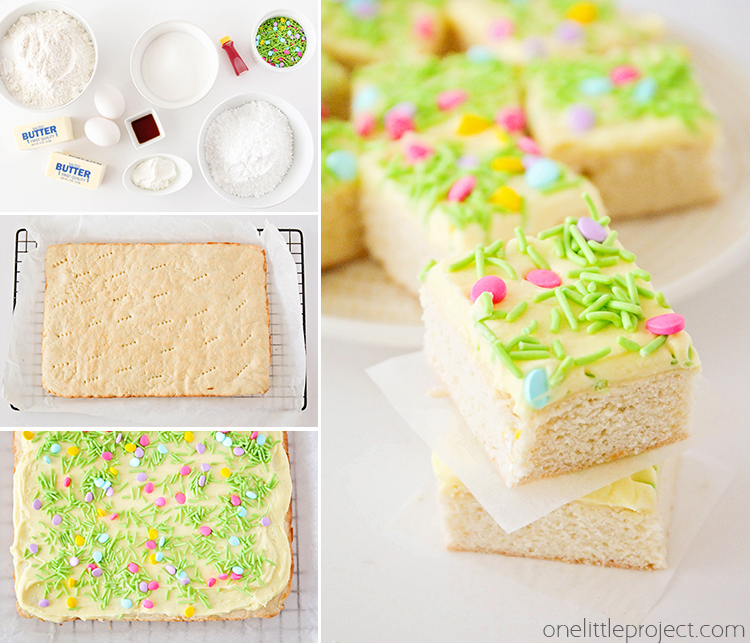 These spring sugar cookie bars are so much quicker and easier than roll-out sugar cookies, and just as delicious! They’re the perfect dessert to celebrate spring! 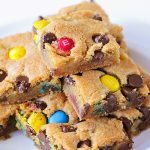 M&M’s Cookie Bars – Chewy and Delicious!